• All tents are white in colour. • The listed rental rates are inclusive of the tent being in the customers possession for a maximum of 4 days, including the pick-up and return dates. For example, pick up the tent on a Friday and return it on Monday. For each additional day a fee of 15% of the tent rental will be charged. This will apply to any tent being picked up early or returned late. In an event where a tent is required for seven or more days, the tent MUST be returned to us NO LATER than 12:00 noon on Thursday. If it is not returned to us by this time, you will be charged an additional rental rate as listed above. No All Purpose Canopy can be picked up without a valid credit card number on file. • Canopy pricing is based on a Customer pick-up/drop-off. Please refer to the Delivery Pick-up Charges for more information. Center pole is 15 feet tall. Customer pick up and return required. 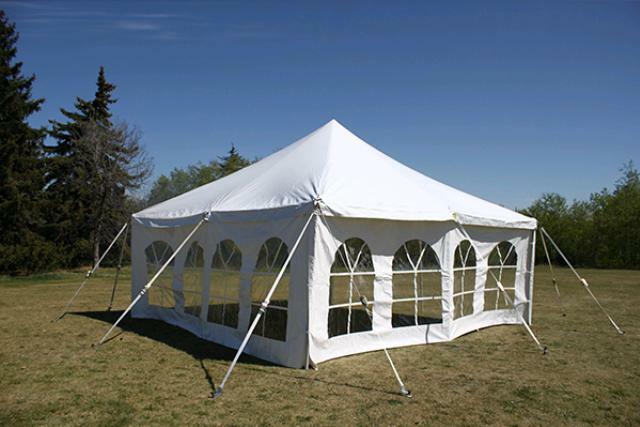 Email Us or Call us at 403-762-2227 to speak to a Special Event Rentals representative.